Blowout Sale! 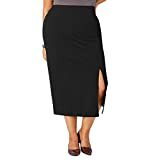 Up to 56% off on Skirts at Femi Store. Top brands include SOR, Inc., Jessica London, Kiyonna, 3 BIG NOTES, Roamans, BohoHill, SE MIU, Woman Within, Regna X, CATALOG CLASSICS, Zeagoo, BEKTOME, SKAVIJ, Avenue, RACHEL Rachel Roy, & Chicwe. Hurry! Limited time offers. Offers valid only while supplies last. View more products in Plus-Size.